You can't even think of all the uses you'll find for this little workhorse! It's designed to hold a standard Little Giant® DuraFlex Muck Tub (70-Quart - not included), but handily doubles as a pneumatic two-wheeler for moving feed sacks, square bales, garbage cans, or any you-name-it cargo up to 350 pounds. The drop-down retaining ring securely holds a Muck Tub or other containers in place, and easily collapses for loading full, heavy, or large items. 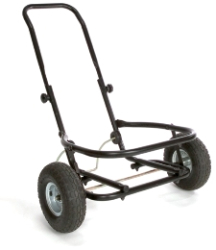 Large pneumatic tires allow the cart to maneuver over almost any terrain, indoors or outdoors. The retractable kickstand holds the cart in place for stable loading and unloading. Adjustable handle locks securely at two heights. It easily folds for storage or for carrying along in a trailer or vehicle. A lifesaver for farm and ranch.